I can’t imagine a man singing this song without a layer of, I don’t know, acting, or translation, or “look at me, how feminine I am”. But the great thing about the piano is that it doesn’t have a gender. I’ve listened to Bill Evans play this song many times. It feels completely natural and direct. 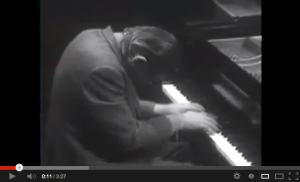 In this live solo version, Bill Evans looks like he’s hanging on to the song for dear life. His hair is lank, he’s hunched over in concentration, and I imagine him desperate for this elusive bit of wonder amid the flotsam of the world. Of course the impression I have of his playing could be the result of pure showmanship. Maybe that hunched over position is a reminder to buy cigarettes and toilet paper on his way home from the nightclub. But I can’t believe that. I buy the illusion. 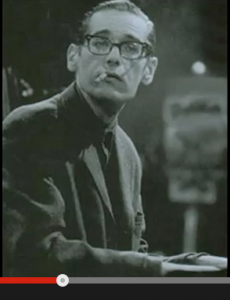 I love the song, and I love Bill Evans’s struggle for the song, his fingers reaching almost smelling for the keys. He lurches up as if from a dream when the song is over and the audience reaction seems irrelevant.